Extremely nice doctor. Beautiful office. Wait was a bit longer than expected due to a system issue but still a goodexperience. Extremely nice doctor. Beautiful office. Wait was a bit longer than expected due to a system issue but still a good experience. I went to Dr. Melepura for lower back pain and he took his time to answer all my questions and toreally understand what I was going through. The wait time was short and I didn’t feel rushed at all during my time there. Highly recommend and will definitely be going. I went to Dr. Melepura for lower back pain and he took his time to answer all my questions and to really understand what I was going through. The wait timewas short and I didn’t feel rushed at all during my time there. Highly recommend and will definitely be going. 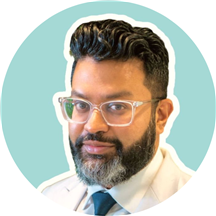 Dr. Febin Melepura is an Ivy League trained physician who is highly specialized in treating any pain related issues - from back and neck to sports related injuries. Dr. Melepura is board certified in Pain Management and Anesthesiology. He completed both his Interventional Pain Medicine fellowship and Anesthesiology residency at the prestigious Columbia University Medical Center. Prior to his specialization in pain management, he received his Doctorate of Medicine (M.D.) at the nationally ranked Stony Brook School of Medicine. He prides himself on being on the forefront for future treatment protocols in both pharmaceuticals and medical devices. He has a strong appreciation for the benefits of the latest research and technology as well as age old alternative treatments, such as nutrition. Dr. Melepura's practice philosophy is to blend medical innovation, evidence based medicine, and compassion to meet each patient's individual goals. He strives to improve functionality and to allow patients to resume active lifestyles. He offers patients the care and personal time needed to thoroughly evaluate their pain and provide them with the most appropriate treatment. Our office works with most insurance and utilizes patients' out-of-network benefits. If you have any questions or concerns, our team can work directly with you to explain your benefits. I would recommend Dr. Melepura without any reservations. Dr. Melepura was very friendly and professional, he spent a lot of time learning my history in order to make a proper diagnosis and I left with a care plan of action. I was seen within 10 minutes of arriving formy appointment time and found the office to be very clean and nice - would definitely recommend him to anyone looking for a pain management professional. Dr. Melepura is a great doctor. He asked me a lot of questions and then examined me thoroughly. I feel confident in his abilities and I am hopeful that I will get back to training soon. I highly recommend this office. Great experience! Dr. Melepura listened to me closely, examined me carefully, and created a plan to help get me on the right track! Happy I found him as my pain specialist and I know I'll be running that marathon this Springin no time thanks to him! 5 stars all the way! Dr. Melepura was thorough and attentive. He has the best bedside manner. I had a lot of questions and he patiently answered all of them without rushing me. Highly recommended and I will definitely be going back. DR. Melepura is a great doctor, wonderful mannerism, professional, very understanding and caring. I highly recommend him. I couldn’t ask for better service. Dr Melepura is amazing and the staff is so helpful. Definitely recommend him. Great experience seeing Dr. Melepura for lower back pain. Was very measured, thoughtful and kind in his approach. Would highly recommend! I’ve been having issues with my back for a long time, but the doctor didn’t offer any real treatment. I walked away disappointed. I then found out that he is out of network, even though zocdoc says he is in network to the plan I selected. He’s the best. Smart, listens to you and offers so many options for pain management. I’m a tough case since I have RA, no cartridge in my knee and a herniated disc in my cervical spine. I’ve continually made progress withInjections, radio frequency abilation and prp. I can’t say enough about Dr M.
incredibly resourceful! He encourages lifestyle changes that prevents future injuries which is exactly what I'm looking for. Very nice guy... told me to try a vegan diet. Good advice honestly however nothing for my immediate discomfort/pain. I don’t know how to use his services. I guess he’s the go to if I break something? Or have some typeof chronic terminal illness- even then he may just refer to regular pcp for pain management. Great experience all-around! The receptionist and Dr. Melepura were both very friendly. He immediately diagnosed my condition and was able to give it an injection for treatment on the same day. The diagnosis was confirmed the next day via an MRI that Dr. Melepura ordered. More than I expected. Well worth it. it was a great experience- from beginning to end. What an absolutely perfect and seamless experience! Not only is Dr. MeIepura extremely knowledgeable and personable, he was able to treat my condition with innovative modalities that prior physicians never offered. I was most impressedwith the transparency of the financial department of the office which easily answered every question I have. I feel truly blessed to have found this office and now have been able to return to all my busy life and sport activities without any issues at all. The perfect doctor and the perfect office for the busy on-the-go New Yorker! The Office is beautiful, and the staff is very welcoming. Very easy check in process, Short wait time to see the doctor. Dr Melepura answered all my questions and explained the best treatment plan for my type of injury. Definitely recommend!!! Dr. Melepura was very attractive and answered all my questions. He has a great bedside mannerDefinitely recommend him!!!! I wish I came here first. Dr. Melepura is excellent! Very friendly and clean office. Friendly staff and very knowledgable. He is the best doctor I have seen so far. He took his time to exam me and asked questions that other doctors never asked. Dr. Melepura was great with the consultation and providing suggestions for what I can do to help with my lower back pain. He listened to the problems I had and saw me right away. Highly recommend! Dr. Melepura was nice, knowledgeable, and professional. Probably the best visit I had with a doctor. Dr Melepura addressed all of my concerns and set me up for a speedy recovery. The office was nice and clean, and the staff was friendly and got me set up with everything. Overall, easy and great visit! It was one of the best doctor's offices I have seen in the city. Very neat, very modern and convinient. Dr. Melepura spent almost 1.5 hour with me, explained me everything, now my issuses make so much sence for me andI know where everything came from. I also was pleased when Dr. Melepura checked on me after couples days I visited him. Yet he answered to all my questions. Very glad I found this office and Dr. Melepura. Higly recommend him and their facilities. Schedule a last minute appointment and Dr. Melepura and his staff were very helpful and understanding. He is the only doctor I’ve visited to properly explain and show concern for my condition. Probably the best doctor visit I ever had. My visit was amazing. Dr Melepura was incredibly patient and understanding. Spent almost an hour with me. Highly recommended. Clearly a very thoughtful and methodical Dr. He was careful to consider all of the information in its entirety prior to making a diagnosis. I'm was impressed and appreciative. Excellent Dr. I would recommend. Dr. Melepura and his team were fantastic. They were professional, patient, communicative, and happy to provide all the information I needed regarding my treatment. He took the time to discuss my symptoms and explained the medical anatomy.He went over my options and took the time to listen to my concerns. Dr. Melepura was very gentle when performing the pain procedure and I didn't even feel a thing. Every interaction I have had with Dr. Melepura and his office including his receptionists, and nurses has always been top notch with no complaints at all. I book all my doctor's appointments through ZocDoc and this is the only one I felt compelled to review. Highly recommended! It was the most impressive office I've seen in Manhattan! paper less, and the assistant was extremely knowledgeable. Dr. Melepura is very down to earth, and explains different methods of treatment. Hope it works out for me there. Very informative and patient. Dr Melepura and his assistants Erika was very professional and helpful with my concerns with my issues. Great! Doctor! He really cares about his patients! He spends time listening to you. He offered several procedures that worked well. Dr. Melepura made me feel very comfortable even though my problem may have seemed silly. He had a great bedside manner and took his time with me. The doctor was very helpful. He was very well trained and you could tell he know what he was talking about. I hate going to doctor but this visit went about as well as I could hope for. Dr. Melepura was extremely professional and courteous. It was great having a doctor so knowledgable. His manner put me at ease immediately. Really appreciated how well everything went.